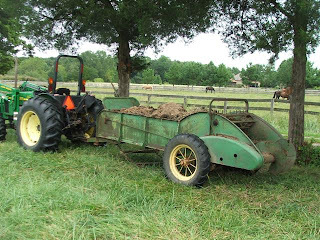 Our beloved 60+ year old John Deere, Model H, Series 47 ground-driven manure spreader, this morning, suffered a work-stopping injury. See that bar hanging kind of cattywampus off the back end just below the hay and manure bits? The one with the "H" chain hanging off the right end? That’s the rod that turns the cogs that rotate the chains that pull the bars that drag the poop to the back of the spreader. This morning, the bracket that supports the rod that turns the cogs that rotate the chains that pull the bars that drag the poop to the back of the spreader broke! 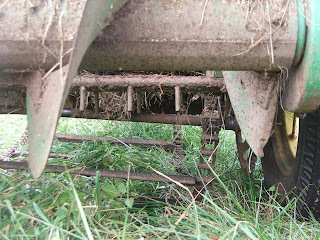 As in there is a piece of 60 year old iron laying somewhere in the foot-tall grass in the field on which we spread the manure, I’m sure never to be seen again until a most inopportune moment arises. Big Sam, as the JD MS is called, is an indispensable part of TREES’ horse care team. We thoroughly enjoyed our day at the Fredericksburg TSC store today. We met a lot of very nice people, some horsey, some not, but all interesting to talk with. We also very much enjoyed meeting the dogs of Bully Paws (and the humans in tow) that were hangin' out right next to us. Several of these beautiful, affectionate dogs stole our hearts. Please consider this organization when looking for future canine family members. One of several highlights of the day was finding possible accommodations for an elder we've been trying to help the owner place for some time. Please keep your fingers crossed, hold your tongues just right and we'll try to work out the details in the next few days. TREES also won a drawing for two bags of Blue Seal Performance, a fairly new low NSC, high fat formula that looks promising for elder horses. We'll let you know how our "trial" goes. Mike, one of our co-founders, later won third prize in the TSC raffle, winning a TSC gift card, goodies from Smokey Bones, a Carhart wallet and maybe a couple other items I've forgotten. 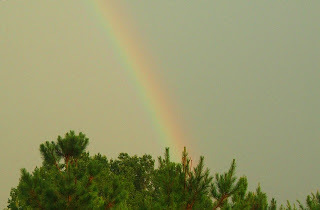 And as I type, a faint rainbow in the eastern sky. Over all, a pretty good day! Tractor Supply is considering hosting animal rescue/ adoption events on a regular basis. These doin's are a little work for them, since they move a lot of their inventory aside to make room for our tables and displays. Next time you shop at TSC, please remember to thank them for supporting local animal welfare charities. And thank you! to everyone who came out to visit, stopped to chat, and offered support of every kind. See you at TSC again soon! Tomorrow (Thursday, August 27, 2009) marks three weeks since the Orange County Sheriff and Animal Control departments took custody of Mona and herdmates. We still have a way to go, but what an improvement already! Checking email this morning, we found an ad from Amazon.com promoting a sale on new and used textbooks. Eureka! A chance to build our horse care library. But, alas. Even "on sale" textbooks on equine subjects are a little out of range of our normal budget. Soooooooo.........seeking donations of used textbooks. If anyone wants to let go of those they have, that is. 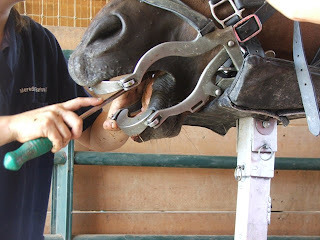 Equine Dentistry: A Practical Guide, Patricia Pence. There are probably dozens more we could list, but you get the idea. Any books that might help us further educate ourselves about the care of our residents would be most welcome. Do you have any collecting dust? If you prefer to use UPS, FedEX or another freight service, please contact us for our street address. With all the hubbub concerning Nathan and, more recently, Mona, some of our other residents are feeling a little left out. To remedy that situation, we're going to attempt to provide updates on everyone over the coming days/weeks. Delphi arrived one year ago, in August 2008. Her owner repeated again and again that Delph must be in "organ failure" since she could not get her to gain weight. Guess what? 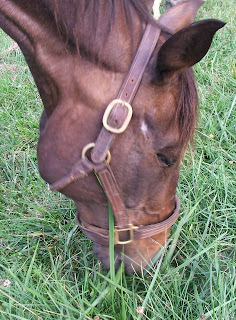 A horse must be fed, and fed an appropriate ration, in order to gain or maintain weight. 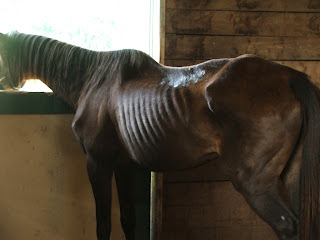 The majority of horses that arrive at Traveller's Rest in this condition are in this condition because they are not being fed an appropriate diet. The second most common reason for this condition on arrival is insufficient quantities of an appropriate diet. In Delphi's case, dental insufficiency is not an issue (yet,) so we can only conclude she was not being given enough food for a mare of her size. She is not a "hard keeper" and is currently maintaining this weight on only 3 quarts of Triple Crown Senior each day and free choice grazing/hay. As herd matriarch of her band, Delphi rules the roost in the "outback" field. Look! One of them dancin' hosses! WaaaaaaaaaHOOOOOOOOOOOOOO!!! Can you hear us in Idaho? 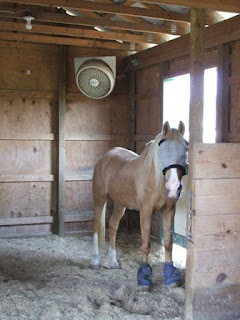 During today's thunderstorms, we confined Nate to his stall to keep his diapered foot dry. This was completely unacceptable to His Highness. As soon as the puddles dried, Nate was given his freedom. He pushed the door open and marched out, tossing his head indignantly. Then.........Nathan collected himself into an absolutely gorgeous canter, flexed at the poll, feet placed just so, and going in a straight line. And he did it twice! Cantered out. Walked back. Threw his head at me and cantered out again. It was breathtaking. OK, in a ring, next to a fit horse in regular training, maybe not so much. But performed by a horse who, less than two months ago, had to lean against a wall to remain upright, it was truly beautiful. Its been pointed out that Nate has been bumped off the front page long enough. So, for all his fans, here's an update. Today ends the first week of Nathan's EPM treatment. We were warned that we might see a temporary worsening of symptoms several days into the Marquis regimen. So far so good, though we're not out of the woods yet. It seems some horses experience this side effect as long as 7-10 days into the treatment. The big news, though, concerns Nate's foot. That right front foot that has been battling the most advanced case of thrush we've ever seen. The foot that was writhing with maggots when Nate arrived. Finally.........progress! We'd like to thank Team Foot Rehab - farrier Ernie Haynes and Dr. Amanda Blanton - for the smooth teamwork employed yesterday to remove all the diseased tissue and start Nate's frog on the road to normalcy. It is still difficult for Nate to stand on three legs for the amount of time needed for a rehab of this type. Taking that into consideration, TFR gave him frequent breaks and showed considerable improvisational skills as they dealt with a frustrating situation. In the end, the diseased tissue was pared away, then Nate's foot was packed with a metronidazole paste, followed by gauze, cotton, an infant diaper, all held in place with several layers of the ubiquitous horse farm duct tape. Though he was a little miffed at the time of the foot work, Nate was motoring around last night in a very animated fashion. His foot is still far from normal, but at least now it feels better. We've talked about "baby steps" until now, but this may be more of a giant leap. Thank you, Team Foot Rehab! Do you know this horse? 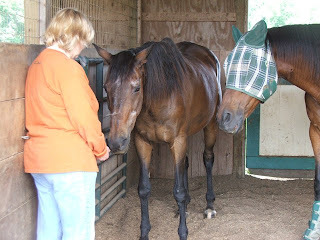 Mona, one of the mare's seized from the "Polo Pony Retirement Foundation" is now two weeks into her rehab. It was two weeks ago today that the Orange County Sheriff's and Animal Control Departments rescued ten starving horses from a farm in Mine Run. Sadly, they arrived too late for 20 other horses. Another 10 were in fairly good shape. Mona's age is estimated to be 30 years old. She looks like a Thoroughbred, but is not tattooed, so we cannot age her through that means. 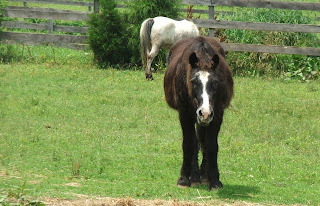 We don't know if she was a polo pony or one of several other types of horses at the "retirement farm." As of today, Mona continues to eat well and gain weight. We are, however, seeing signs of some respiratory difficulties. All blood tests showed normal results, leading to the conclusion she does not have a respiratory infection, so Mona will begin treatment for "heaves" or COPD today. Our current hot spell is not helping, of course, but the forecast calls for much lower temperatures this weekend. Hopefully that, and her new meds, will help Miss Mona breathe easily. There has been widespread coverage of this case in VA. One reporter, however, seems to think this an "Orange County story" that should "stay in Orange County." No, this is not an Orange County story. This, folks, is national. Horse owners from throughout the polo world sent horses to this "retirement" facility, thinking their animals would be well cared for during their post-polo years. Now, those owners are frantically looking for information about the horses involved in attempts to determine if their horses are alive or dead. These photos were taken August 17, We apologize for the quality of the photos, but were trying to email info to those seeking help as quickly as we could. Even though we didn't have good lighting, these pictures do show Mona's markings. 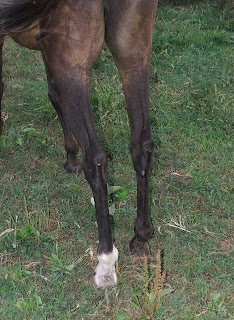 If anyone recognizes this mare, please let us know. She is currently safe and under a vet's care. One other thing about Miss Mona. This mare loves people. She must have known great kindness and care in her earlier years. I can't imagine what it was like for her to have been locked in a small dirt enclosure with no food, water, or human social contact. Some details of the Orange County case are being made public. For the first news coverage, please visit Charlottesville's NBC29. 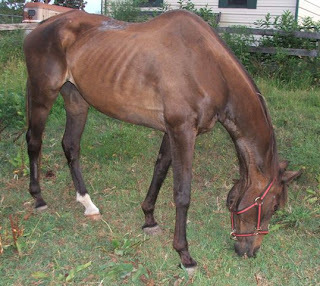 The hearing on August 21 involves multiple counts of general cruelty and failure to bury deceased animals. Just Kidding! 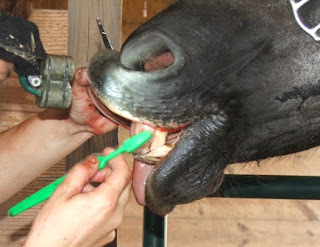 While we did begin a weekend Dentathon today, there is much more to equine dental care than brushing. Below, the dentist explains why this tooth with decayed roots was very loose and needed to be removed. Jubal was already missing several teeth before today, but regular checkups are still important to detect problems like decay or fractures, or to correct sharp edges that may cut the cheek, tongue or gums. Finally, the remaining healthy teeth are hand floated to remove sharp edges and make chewing action more efficient. Nate, Nate, Nate. The big man just doesn't believe we have any valid reason to limit his exercise. Or for us to keep fussing at his feet. During today's farrier visit, Nate stood quietly enough, but kept, very gently, nudging me with his nose as if to point out this is all unnecessary. Unfortunately, Nathan, yes it is necessary. However....after a quick exam of the right front foot -- the foot fighting advanced thrush -- the farrier decided he'd like to have a veterinary consult before moving further. Thus, Nate got a reprieve. His trim was rescheduled for next week. The moment his halter was removed, our clown-with-the ever-growing-'tude cantered to the far end of his small paddock and turned to stare at us as though daring us to try that again! And so we enter the next stage of rehab. The "I Feel Tons Better So Now Let's See How Much I Can Get Away With" stage. This phase in the healing process is always interesting. Sometimes its funny, as seniors execute (or attempt to execute) maneuvers not performed in many years. Sometimes its frustrating as they tell us they don't know how to do something we know they can do with their eyes closed. Always, though, it triggers a few "discussions" on what constitutes acceptable behavior. 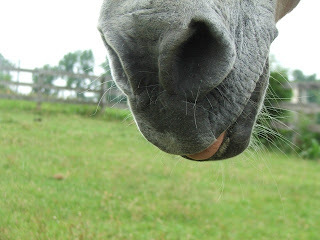 Always remember......an "old" horse still weighs half a ton, more or less, still has four hooves and teeth. And there is no such thing as "bombproof." 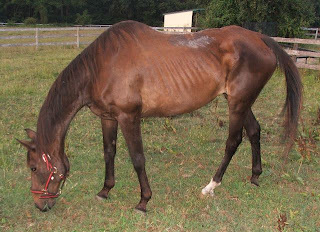 In a hearing yesterday, the Orange County Sheriff's Department was granted permanent custody of all horses, including Mona, seized in a cruelty case last week. The Sheriff's Dept, in turn, is turning permanent custody of Mona over to Traveller's Rest. Mona and her surviving friends are safe. May their 18 companions Rest in Grace. As for Miss Mona, she had her first turnout at liberty today, and was quite unhappy at the short time span. 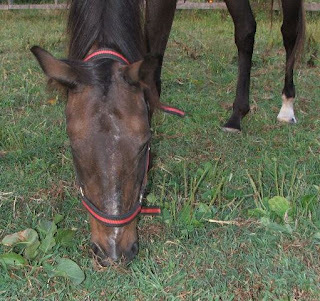 Mona was confined to a small dirt lot for an unknown period of time, so will be introduced to grass slowly. She is starting with only 15 minutes of grazing, twice a day. The time will be gradually increased over several weeks. Eventually, she will be turned out in a private paddock 24 hours a day, where she will continue to gain strength before being introduced to a herd. If today's performance upon being returned to her stall was any indication, we're going to see Stage 2 early in this one. Visit TREES at Tractor Supply Aug 29! A nice cool, indoor event! On Saturday, August 29, the Tractor Supply Company on Plank Road (Rt 3) in Fredericksburg, VA, is hosting an animal welfare/rescue/adoption event. As of now, our table will be inside, toward the rear of the store, near the horse supply section. Please be sure to seek us out and say "Hi." The Fredericksburg Tractor Supply is at 4179 Plank Road (Rt 3) just west of the Salem Church Road intersection. And while you are there, please thank the store management for supporting animal welfare organizations! We all need all the support we can get these days! but there's nothing dirty going on!" Dolly Parton fans will recognize the lyrics. And so, of course, our new mare's name is "Mona." Our goal is to have our "Mona" showing some of the same voluptuous curves as Dolly's "Miss Mona" in short order. One more new resident. While we always look forward to getting to know a new arrival, just welcoming a new arrival means that someone somewhere met with trouble. In this case, quite a few horses met with trouble. Yesterday morning, TREES received a call from the Orange County Sheriff's Department, asking if we could house a senior mare who, along with several herdmates (being boarded elsewhere,) needed some TLC pending legal action. This afternoon, the mare arrived. We don't know a lot of details about the case in general, but want to say thank you to the Orange County Sheriff's deputies and Animal Control for helping quite a few horses escape what appear to be very dire circumstances. 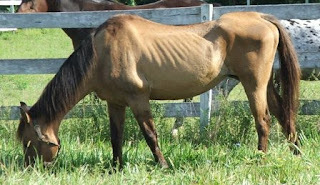 Unfortunately, cases like this mare's seem to be more numerous than in the past. Calls for help are coming more and more frequently. 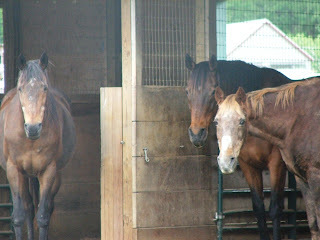 Many times, senior horses are the first to suffer since they often need a little extra care and can be difficult to sell or place in new homes. TREES is currently operating at absolute maximum capacity and needs your support. Please consider the following ways to help, especially as you do your back-to-school shopping! Zazzle! 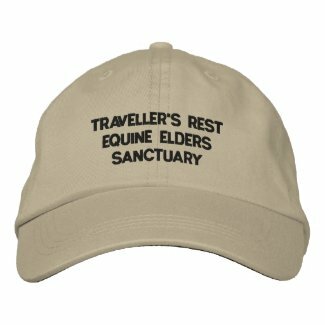 Buy customized Traveller's Rest merchandise. We're adding new items as often as we can find the time! iGive: Online mall including over 600 stores. New members earn a $5.00 donation for TREES when shopping within 45 days of original registration. Stores include 1-800 PetMeds, BabyGap, Back In the Saddle, Birkenstock, Chocolate Source, Eddie Bauer, Land's End, Montgomery Ward, Old Navy, PEt Food Direct and hundreds more! Use iSearchiGive as your Search Engine and help the residents of Traveller's Rest every time you search the web. Of course, direct donations are welcome at any time. You can donate online through paypal or mail a contribution to TREES, PO Box 2260, Spotsylvania, VA 22553. Meanwhile, our new guest, who as yet has no name, has had a small supper of Triple Crown Senior and alfalfa cubes, a small portion of grass hay, a nosh of salt and an energetic roll in fresh sawdust. Fingers crossed, this rehab won't be as complicated as Nate's, but if it does take some unexpected twists and turns, we'll do our best to keep up. A diagnosis of EPM is often difficult to confirm. It can be ruled out when a test of either blood serum or cerebrospinal fluid shows a negative result. 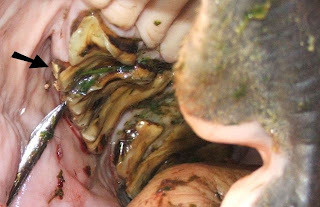 A positive result using CSF is "highly suggestive" of the disease, while a positive result in a serum sample only proves that a horse has been exposed to the protozoa (Sarcocystis neurona) that cause the disease. In Nate's case, we tested serum. Based on the result and clinical symptoms, it was determined that there is a 90% chance he has the disease. Reason enough to start treatment ASAP. We've opted to use a product called Marquis, hoping for quicker results than some other treatments offer. Marquis should kill any protozoa present, but it will not repair existing damage to Nate's nervous system. Unfortunately, at this point, there is no way to know how extensive that damage may be. 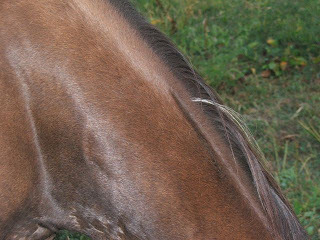 EPM, like Cushings, affects each horse in a different way, depending in part on where the lesions are and how long the disease went untreated. We also don't know how Cushings may complicate treatment or how EPM may complicate Cushings. In other words, for every answer we get regarding Nate's case, we get five or ten new questions. The good news is, for now Nate is doing very well. He's eating well, gaining weight, and his spirit is bright. Last night, in a little burst of energy after hand-grazing, he tried a little lope after being turned back into his small paddock. OK, so it wouldn't have been considered "pretty" to most horse folk, but to us it was a gorgeous sight to see. Nate felt "kick-up-your-heels" good. Even if it turns out he only has a short time left in this life, we know he had that. 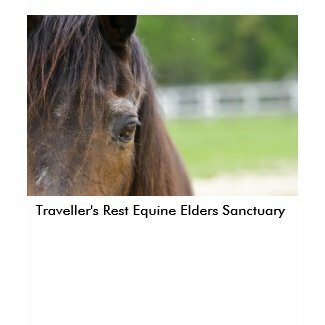 Traveller's Rest Equine Elders Sanctuary recently received two bottles of Ferrell Hollow Farm Natural Fly Spray. Now I will admit, I was more than a little skeptical about this product since it smells more like salad dressing than like fly repellent. I beleived that something that smelled so yummy to me would smell yummy to flies as well. However......as of this morning, I highly recommend this spray to anyone seeking alternatives to chemical repellents. 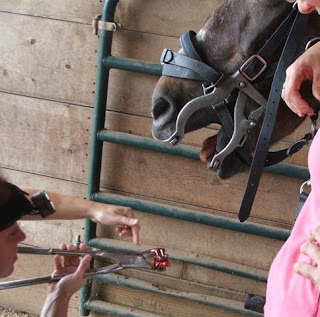 We tried the spray during hoof trims, and the farrier himself commented on the results. We also received two bottles of coat spray, which we haven't tried yet, but after what we saw with the fly spray this morning, can't wait to try it out. According to the product description, "Natural Coat Spray is wonderful to brush off sweat and grime, condition the coat, soften dry manes and tails, soothe itchy skin and insect bites and leave them with a beautiful shine." We have just the guinea pig.......Josh! He's had problems with dry coat and itchies since he arrived. We'll see what happens. If it works for him, I'd have to say it would work for most any horse. 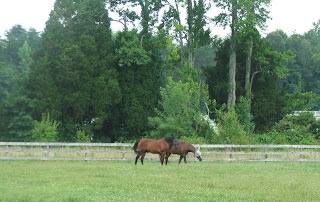 Ferrell Hollow Farm is a Tennessee facility that "specializes in Full Pasture Boarding for Senior and Special Needs Horses." For more information, please visit their web site and be sure to check out the "Products" page. In addition to regular horse care expenses, TREES now has seven - 7 - "lucky number" - horses in our "Cushings Herd." That means seven horses on pergolide. (If it doesn't hurt too much, we may figure out the cost per day of that alone and post it later.) We're not complaining, mind you. 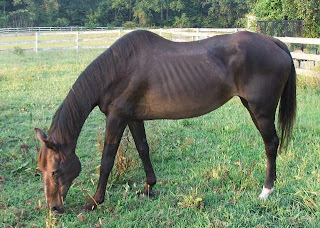 Ten or fifteen years ago, there were no truly effective treatments for Cushings, and a diagnosis of Cushings was viewed by many horse owners as a death sentence. Not so these days, but there is that pesky bill to deal with. 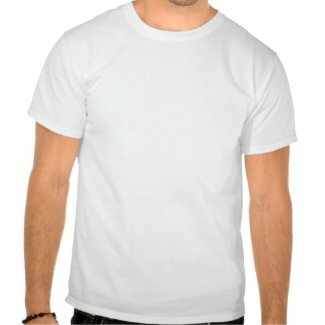 In an effort to find more ways to help you help us, TREES is opening a store on Zazzle.com . The store is in its infancy, but we hope to add many many more items over the next few weeks and months. We chose this option as a way to raise money because it costs us nothing in terms of overhead. We upload images or designs, you order customized TREES merchandise directly from Zazzle, and TREES receives a "royalty" for each item. 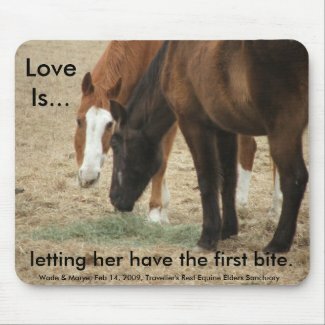 For a sneak peak, visit http://www.zazzle.com/equineelders* . Check back often to see what is being added. And, please.....send us your requests for specific Zazzle products or specific TREES residents you'd like to see added to the product line. We'll do our best to accomodate! Nate had his first real pedicure last week, but not without some setbacks at the same time. Progress came to a halt when real summer temperatures arrived. As anyone who has cared for a Cushings patient knows, heat is the enemy. 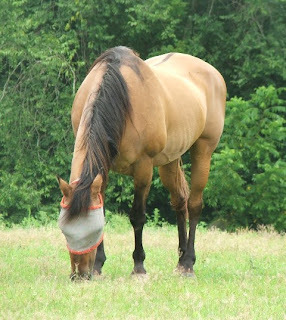 One of Cushings' common symptoms is impaired ability to maintain a normal body temperature in either extreme cold or heat, though in our experience, Cushings horses have more trouble dealing with heat than with cold. To try and combat this new complication, Nate was started on pergolide last Friday and today we will tackle his "Cushing's Coat" with our new Clipmasters. His clip will likely be more than a one-day job, but hopefully will make him more comfortable and remove one more physical stress. Nathan's new coif will not be "pretty" but we're going for function rather than style, so when you visit, try not to snicker and remember this is meant to help keep his body temperature down, not prepare him for EQ magazine.